Coach Read has also served as an assistant coach in the WNBA with the Phoenix Mercury, Orlando Miracle, and San Antonio Silver Stars. He was an advanced scout for the Orlando Magic as well as The Charlotte Sting. 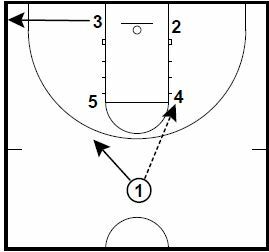 This play is a quick hitter to use against man to man defense. 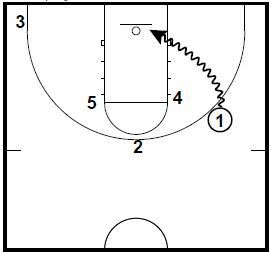 1 passes to 4 at the elbow and takes 2 steps away from the ball. 3 spaces to the corner. 2 curls high to the top and sets a split screen for 1. 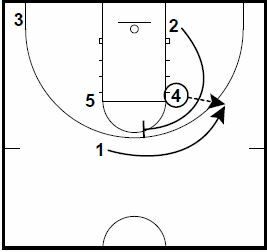 1 will come off the split screen and get the handoff pass for the jump shot. If 1 does not have the jumper, he can drive hard to the basket for the layup!! Any coach looking for the latest and innovative plays from the Professional, College, or High School levels can stop looking. With a compilation of over 7,700 different plays, you will never need to purchase another basketball playbook again. These playbooks can be used as a great reference tool for years to come. This 2 Volume Book includes plays from 19 different play categories, and they are the most extensive playbooks on the market. The Basketball Encyclopedia of Plays (Platinum Series) contains over 7,700 Plays (Both Volumes combined) from the NBA, WNBA, USBL, and College levels from someone who has worked as an Advanced Scout or Coach on each level!!! This book has been intensely compiled over the last 21 years, with plays taken from a lot of NBA Coaches (past and present), WNBA coaches, and College coaches (Men’s and Women’s) from around the country. Any coach that is serious about improving their knowledge of the game from an X and O standpoint will benefit tremendously from these books. These Books can be used to discover New Quick hitters, add a New Package to your playbook, or develop an entire Offensive System. There are a lot of new ideas and concepts in these books to study, and the Basketball Encyclopedia of Plays can be a great resource for coaches on all levels!!! This book is definitely for those X and O junkies who are always looking to improve as a Coach.